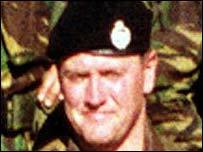 The mother of Sgt Steven Roberts needs to know life "was not wasted"
The family of the first British soldier killed in the Iraq conflict say a meeting with President Bush would help them to decide if the war was justified. Samantha Roberts, whose husband Steven, 33, was killed in action in Basra in March, says she knows the Iraqi regime had to be toppled but would like to question the American president about tactics used. President Bush is expected to meet bereaved families when he visits the UK next week to tell them their loved ones have not died in vain. But some other families have reacted angrily to the president's plans. Mrs Roberts, of Bradford, West Yorkshire, told BBC News: "I would like to know if 'shock and awe' was the last resort or were there any other options? 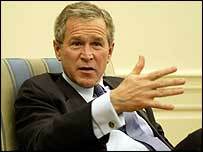 "We knew that Saddam Hussein had to be removed, however I am suspicious about the ways they actually did it. "I think to see somebody's face when you ask those questions, I think it would reveal an awful lot." Sergeant Roberts' mother Marion Chapman said if offered the chance to meet the president she would urge him not to pull peace-keeping troops out of Iraq "like your father did". "If they don't settle the country and help them back to normality then Stevie's life was wasted", she added. But Reg Keys, who lost his 20-year-old son Tom in June 2002, said he holds Bush and Tony Blair responsible for his death. "I don't know how the man (Bush) has the nerve to show his face in his country after costing the lives of 53 British servicemen," said Mr Keys, of Llanuwchllyn, near Bala, in Wales. "I haven't had an invitation for an interview with Mr Bush, if I did I would literally walk from Wales to London to meet the man, look him in the eye and tell what I think of him. "They didn't die for a noble cause, they died for Bush's political reasons, they were just sacrificial lambs." Mr Keys's son was one six military policemen shot dead in Al Majar al-Kabir last June. The servicemen were chased into a police station and shot. The British Army said all the deaths were murder Mr Keys has demanded to know why his son and his fellow officers did not have back-up.